Arm in arm, Jordan Milroy and Conan Visser tackle the steps of One One One, Eagle Street. 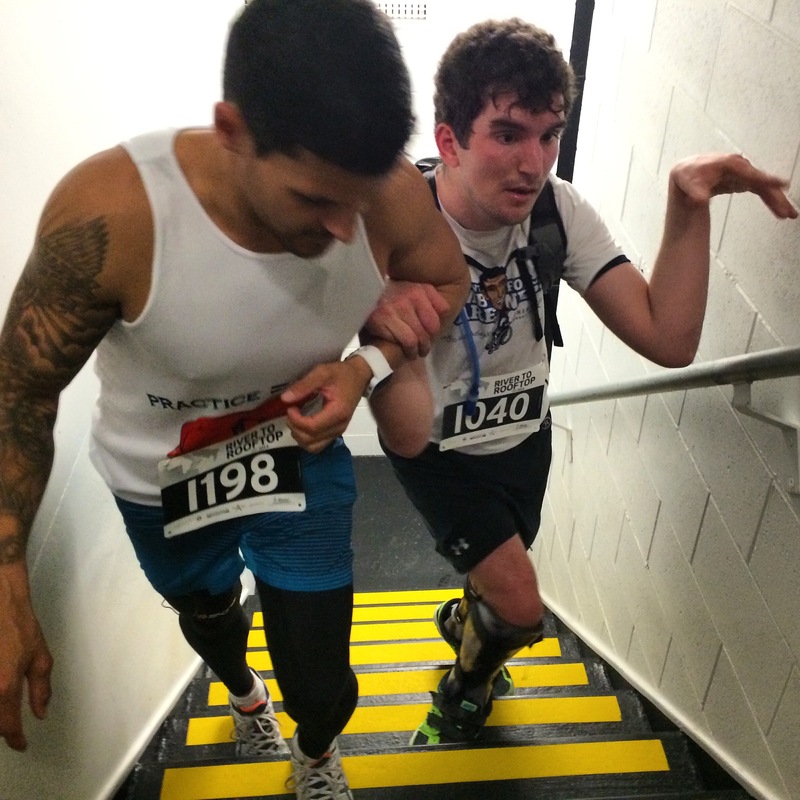 True rags to riches hero Jordan Milroy become the first Cerebral Palsy sufferer to climb the world’s tallest buildings to raise funds for disability awareness. On November 7, he will climb all 1700 steps of the CN tower in Toronto before climbing his tenth and tallest tower in Chicago a day later. Jordan, 25 turned to climbing in 2012 as an escape from public speaking. Since then he has conquered the 1029 steps up Auckland’s Sky Tower, the staircase of Melbourne’s Eureka tower (1600 steps), Brisbane’s 1 and 111 Eagle place (900 steps), Sydney’s center point tower (1800 steps), Gold Coast’s Q1 tower (1900 steps) and Las Vegas’s Stratosphere (1700 steps). Now he’s heading back to the US to expand his throng of followers. Although Mr Milroy’s mission might be massive, his agenda is simple. “Climbing towers gives me an opportunity to show society that no matter what ability you may have anything is possible,” Milroy said. He has partnered up with Icaniwill, a children’s charity devoted to changing the lives of children with special needs. “Cerebral Palsy can sometimes limit sporting dreams and opportunities for those living with it,” Malroy said. Icaniwill founder and good friend Conan Visser said Jordon is a true inspiration for people with special needs. “During our first climb no one was at the top to cheer him as they estimated his climb to take 4hours, not 40 minutes,” Visser said. As well as raising awareness Jordan hopes to donate 1000 wheelchairs specially designed for rugged conditions in developing counties. He is particularly passionate about assisting those living with disabilities in his home country, Samoa.